Just a few miles outside the gates of Fort Belvoir visitors and residents of Fairfax County can find some of Virginia’s finest historic homes and our nation’s treasures. For their time these homes were the envy of the neighborhood and the owners most certainly among the richest families in Fairfax County. Sitting on the best piece of property that any colonist could have imagined is Mount Vernon the home of George Washington. It doesn’t take a lot of imagination to picture the prominent colonist in the 1770’s sitting on the back porch watching the large mast ships headed into the docks in Alexandria. With the distinguished white frame home, stone fences and outbuildings wandering through the grounds is a great way to get a feel for how life might have been like so long ago. If you happen to be in the area between on a weekend between January 12 and February 10th you can get a peek in the basement of Mount Vernon to see the cornerstone of the property. This is a special event coinciding with the movie National Treasure II which suggests that the cornerstone actually opens to a secret passageway under Mount Vernon. Sorry but that is just a bit of Hollywood magic. Just a short hop down the road you will enter the gates to Woodlawn Plantation. Looking at this stately brick home built between 1800-1805 you have to be amazed by the construction and architecture that created a home that has stood for 200 years. Built for George Washington’s grand-daughter Nelly Custis-Lewis on a 2,000 acre site, the property the home is a beautiful example of the Federal style popular with mansions at the time. Designed by the same architect, William Thornton, who created the US Capitol the home was furnished with many of the original pieces from Mount Vernon. Situated at the top of a hill known as Gray’s Hill the back porch of the home has a view of the Potomac River and was the first property owned by the National Historic Trust formed in 1951. The last stop on this tour of Fairfax County’s rich and famous colonists is Gunston Hall home of George Mason. Built between 1755-1760 and designed by one of the indentured servants, William Buckland, the home was one of the first with elaborate woodworking details that were not typical for the time. Originally situated on 5,500 acres the home had a unique architectural design the most notable was that the upper and lower floors were not an exact duplicate of each other. There are still archeological digs on the grounds of the property trying to determine some of the placement of the original landscaping and outbuildings. Gunston Hall maintains a flock of rare Hog Island Sheep and Devon Steer. So if you have PCS orders to Fort Belvoir this spring and are planning house hunting you might want to check out these famous Fairfax County homes while you are in town. They aren’t for sale but I would be glad to help you find one that is. I'[m not familiar with any of it. We have some rich people and world known people in our back yard, but not to the extent that you seem to have. Blessings in 08! These huge homes are amazing, such beautiful architecture and so well constructed. My Dad is a builder/developer...family vacations always included touring historic homes. Boring to me then, fascinating to me now. Isn't that the way it is? That is a great blog about your area, I love reading the history. It is so easy, as we zip up Rt 95 at 75 MPH, to forget how much history there is in that area of Virginia. Lance-Wow I don't think those are houses but more possibly hotels. Yes there are some incredible homes both historic and non that are worth a peek in our area. Cynthia-my daughter when she was young used to make the rounds with me to builder sites. It was torture to her too, but now as an adult she gets it and has formed some strong opinions about architecture and building. Kevin-you get up to 75 MPH on 95? How the heck do you manage that? Just kidding, you are right I am actually going through a rediscovery phase of the history in the area. I'm jaded as a native and realized I need to go back to the places that I dragged all of my visiting relatives when I was growing up. I have a new perspective now. Christina-one thing we seem to have plenty of is history. Fortunately some of it was saved from the developers who tore down so much of it before anyone realized how important it could be. Cindy: Great blog post! I love the pictures and the details. Architectural wonders should be appreciated! :) All the best in 2008. Fascinating information! Military transferees will eat up this stuff. Richard-we were slow as a country to realize what we needed to save. I'm glad I live in an area where there are so many great locations to visit. Cindy - Great post!! Thanks for sharing this with us on AR! Joseph-Thanks for taking the tour of some of our famous homeowners. 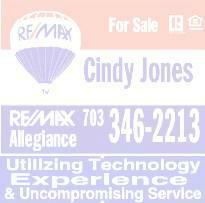 Cindy, I love the way you work so much rich historical information in your posts about Northern Virginia. Blog on! You know how to give a tour! Great information for anyone new or old to the area. Congratulations on being featured in the military relocations group! Margaret-Thanks for the heads up. I hadn't gotten that far today. Three new listings (2 rentals and1 for sale) to deal with today. All perfect for any military folks headed to NOVA. Will be in the MLS today! Have A Northern Virginia Real Estate Question?